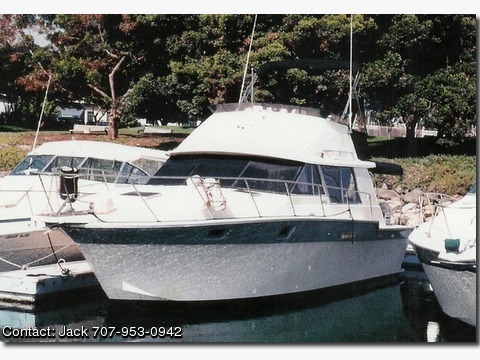 BOAT OWNER'S NOTES for 1986 SILVERTON 34 Convertible Call Boat Owner for more information or questions: Jack @ (707) 953-0942 Overview: This boat is turn-key ready as a comfortable live-a-board, a fun day of cruising or a day of fishing, it has twin GM small block gas Crusader engines, with a deep V hull and has been professionally maintained by a marine mechanic and it runs great. Features: This boat has a large aft deck perfect for entertaining guests or for the kids to lay out their sleeping bags, the fly bridge has 3 captain chairs and a bench seat for guests, inside the cabin is nice and bright with windows all around and a sliding glass door which leads to the aft deck, there are beautiful wood cabinets along the starboard side of the salon and a sofa on the port side which opens into another full size bed (the boat will sleep 4-6 and is carpeted throughout), the salon also boasts an inside helm for those bad weather trips, the sunken galley area has an alcohol/electric stove, Norcold refrigerator, sink and microwave, opposite the galley is a great dinette which converts to another sleeping area, there is a new full size bed in the forward cabin along with lots of storage space, the head has a full stand-up enclosed shower, large sink area with hot and cold pressure water and vacuflush marine toilet, sliding glass doors open onto the aft deck area with lots of canvas to completely enclose the aft deck to convert it to another room plus a full bimini top. Additional Information: Bow pulpit, extended bow and side rails, cabin alarm system, Halon fire system, fresh water cooling on engines, (3) - 12 volt batteries and switch, full delta canvas, windshield covers, electric anchor winch, anchor and line, bilge pump, blower, windshield wiper, hydraulic trim tabs and battery charger. Electronics: 2 VHF marine radios, fathometer, GPS. Questions ? : Call Jack @ 707-953-0942.